Elec Cert Ltd was formed by Gary and Nina Brightwell. Gary has over 25 years of experience within the electrical industry including testing and commissioning of large commercial/industrial projects throughout the UK. Electrical Testing is the driving force behind Elec Cert Ltd with attention to detail being of utmost importance. Elec Cert Ltd provides services to both public and private sectors such as Local Authorities, Housing Associations, Hotels, Education, Industrial, Landlords, Health, Retail and Financial establishments. Due to requests from some of our clients, Elec Cert has extended their services to include a full scope of electrical installation and maintenance works. 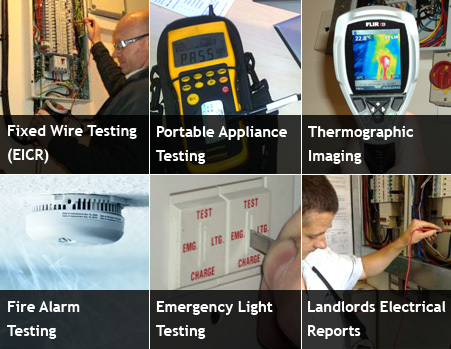 Elec Cert Ltd can deliver a tailored service that fits our clients’ needs. CHAS - We are registered with the Contractor Health and Safety assessment scheme (CHAS), which confirms our compliance with health and safety law. CONSTRUCTIONLINE - The UK’s register of pre-qualified local and national construction and construction-related suppliers and is owned and endorsed by the Department for Business, Enterprise & Regulatory Reform (BERR). TrustMark - This accreditation is a nationwide Government backed scheme which helps consumers find reputable tradesmen to carry out work inside and outside their home. JTL - Elec Cert Ltd upholds electrical apprentices in conjunction with the JTL. SMAS - SMAS is a member of Safety Schemes in Procurement, SSIP. We are a H&S Assessment organisation that takes great pride in our professionalism, customer service and efficiency. ECA - The ECA has been a driving force in the electrical engineering and building services industry since its formation in 1901. Today, many organisations that are involved in improving industry standards and embracing positive change do so as a direct result of ECA involvement or alternatively engage with the ECA on an ongoing basis.